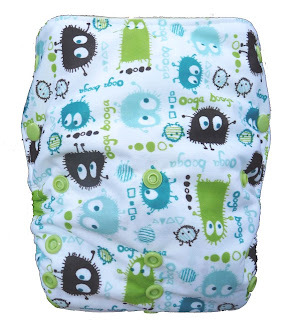 Knickernappies just released our very first print diaper, and it's Ooga Booga! It's been nearly 5 years in the making, but we are finally releasing a Knickernappies one size in a PRINT!! Knickernappies retailers will now have Ooga Booga in Lime, Turquoise, and Chocolate with coordinating snaps and fleece. These are adorable and ready to ship! Currently available only in the One Size cloth diapers. So what do you think? Will you be scooping up this adorable print before it's gone! OMG it's so adorable!!! Do we have a chance to win one? I'm just getting started with cloth diapering and a friend told me about Knickernappies. They are so cute!